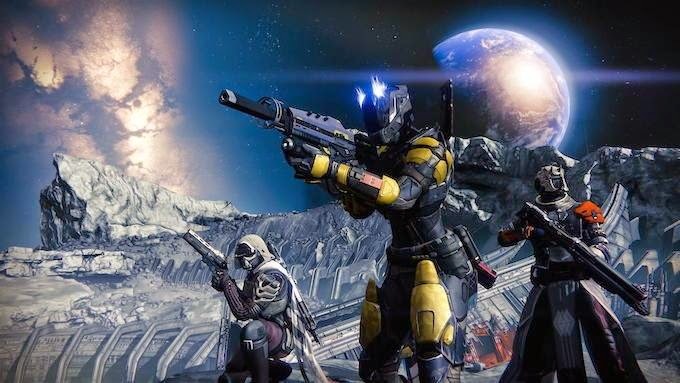 [Source: Syfy] Bungie is poised to present its latest FPS, Destiny, a bold, solar-system-spanning sci-fi multiplayer game created by an ambitious cast of hundreds and costing nearly $500 million to develop, produce and market. Published by Activision, the game's future evolution is purported to have a 10-year lifespan and become a divine Halo-like experience for laser-blasting gamers worldwide. This stunning trailer combines some electrifying cinematic scenes and actual gameplay with a hyped-up Halo-meets-mythic-Mass-Effect tone, matching the expansive storytelling of a traditional RPG with the trigger-happy toys of a first-rate FPS. Mount up and catapult into your first interstellar quest. From the creators of Halo and the publisher of Call of Duty comes Destiny. With an unprecedented variety of FPS gameplay, Destiny promises to deliver an incredible story set within a newly-imagined, always-connected universe filled with action and adventure. Everything changed with the arrival of the Traveler. It sparked a Golden Age when our civilization spanned the solar system...but it didn't last. Something hit us, knocked us down. The survivors built a city beneath the Traveler, and have begun to explore our old worlds, only to find them filled with deadly foes. In Destiny, you are a Guardian of the last safe city on Earth, able to wield incredible power. Defend the City. Defeat our enemies. Reclaim all that we have lost. Destiny launches on September 9th, 2014 for Xbox One, PS4, Xbox 360 and PS3 consoles.